The Mauritius Post released on 31 January 2013 a Special Commemorative Cover to mark the 150th birth anniversary of Baron Pierre de Coubertin, the father of modern Olympic Games. Born on 1 January 1863 in Paris, France in a family of Italian origin, Pierre Fredy de Coubertin studied at a Jesuit school and then at the "Ecole de Sciences politiques" (School of Political Science). He spent part of his youth in the familial home, the Mirville mansion in Haute-Normandie, northern France, and in Paris, at 20, Oudinot Street, where the seat of the International Olympic Committee was initially located. Pierre de Coubertin founded the first International Olympic Committee (IOC) on 23 June 1894 in Sorbonne, Paris; the first Games were awarded to Greece, the cradle of Ancient Olympic Games. 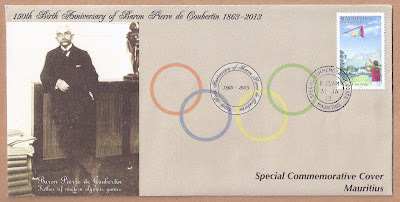 De Coubertin only became the President of the IOC in 1896 until his resignation in 1925. He was passionate about history, sports, pedagogy, sociology, cultural heritage, art and politics and was a keen writer and sportsman. The Olympic rings (five inter-locking rings coloured blue, yellow, black, green and red on a white background, mistakenly reproduced on the SCC) combine the colours of the flags of all participating countries at that time. Baron Pierre de Coubertin passed away on 2 September 1937 at the age of 74. N.B. : Part of the above text was translated from French from the insert. From the 'Traditional Games' issue of 7 December 2006.